"TIJ" redirects here. For the movie, see The Italian Job. For the metalcore band, see Texas in July. For other uses, see TIj. Tijuana International Airport (IATA: TIJ, ICAO: MMTJ), sometimes referred to as General Abelardo L. Rodríguez International Airport, in Tijuana, Baja California, Mexico, is Mexico's second northernmost airport after Mexicali International Airport. 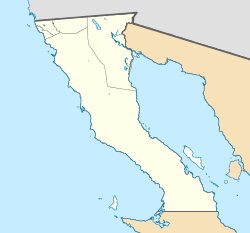 The airport is located in the city's Otay Centenario borough, just immediately south of the U.S border. It's one of the 25 busiest airports in Latin America, handling 7,835,100 passengers in 2018, and the fifth busiest in Mexico after Mexico City, Cancun, Guadalajara and Monterrey airports. The airport can handle up to 10 million passengers per year and 360 flights per day. The airport serves as hub for Volaris and a focus for Aeromexico, currently the second leading airline at TIJ, and the only one operating at both concourses. It used to be a focus city for Aero California, Aerolíneas Internacionales, Líneas Aéreas Azteca, and ALMA de Mexico. Tijuana's airport was the largest and main hub for Avolar, a new low-cost airline (since August 2005), and the airport's second leading airline at a time. It was one of the first low-cost airlines in Mexico, such as SARO and TAESA. It is operated by Grupo Aeroportuario del Pacífico, a holding group that controls 12 international airports in central and northern Mexico. In terms of domestic destinations (totaling 34 cities), it is the best connected airport after Mexico City. Main corridor of the airport. The Tijuana airport opened as the "Aeropuerto Federal de Tijuana" on May 1, 1951, replacing Tijuana's former airport, then located on today's Aguacaliente Boulevard. The airport's runway had an orientation of 10/28 and was 2 kilometers in length (6,500 feet) and the first terminal was built on the southwest part of the airport, facing the current terminal built in 1970. The airport was named after General Abelardo L. Rodríguez, Governor of Baja California, and late President of Mexico. In 1954, Mexicana de Aviacion began direct Tijuana-Mexico City flights. The airport was incorporated to ASA in 1965. Under President Gustavo Diaz Ordaz, a National Plan of Airports was initiated and headed by Gilberto Valenzuela Ezquerro, Secretary of Public Works (Secretario de Obras Publicas). As more people arrived and settled in Tijuana in the 1960s, demand for flights increased. At the inauguration of the Amistad Dam between Texas and Mexico in 1969, President Richard Nixon notified President Gustavo Díaz Ordaz of his intent to initiate Operation Intercept to stem the flow of narcotics between the U.S. and Mexico. As political pressure rose between Washington and Mexico City, to minimize incursion into U.S. airspace, Gilberto Valenzuela Ezquerro, Secretary of Public Works and in charge of the Tijuana airport’s expansion, re-oriented the runway from 10/28 to 09/27. The change in orientation impacted Tijuana's approach over Cerro San Isidro, a 2,600 foot (800 meter) land obstacle which increased the east approach glide slope above 3 degrees and prevented a full Instrument Landing System (ILS approach) on the 27 runway required during foul weather landings. Due to prevailing winds, the 27 runway is Tijuana's main approach pattern. The construction of the new terminal and a 2.5 kilometer 09-27 runway to accommodate larger aircraft was finished in July 1970 and inaugurated on November 19, 1970, by then-President Gustavo Diaz Ordaz and Gilberto Valenzuela Ezquerro, Secretary of Public Works. The total cost for the improvements in 1970 was $108,487,000 Pesos ($8,678,960 U.S. dollars). The original terminal was then assigned as an air base for the Mexican Armed Forces, and it is now known as the aeropuerto viejo, or old airport. The terminal, however, is seldom referred as Terminal 1, with Main Terminal being referred as Terminal 2. Mexico’s airport privatization program was initiated on December 22, 1995, when the Ministry of Communications and Transportation (Secretaria de Comunicaciones y Transporte) published the "Ley de Aeropuertos" (Airport Law). 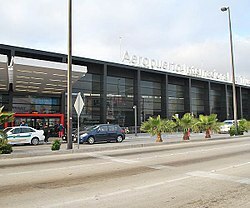 The Tijuana airport became part of the Pacific Airport Group (Grupo Aeroportuario del Pacífico) consisting of 12 airports and headquartered in Guadalajara. 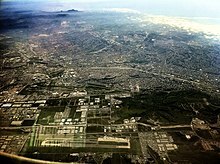 In 1999, a consortium consisting of the Spanish investors Unión Fenosa, Dragados and Aeropuertos Españoles y Navegación Aérea (AENA), together with the Mexican strategic investor Grupo Empresarial Ángeles, collectively known as Aeropuertos Mexicanos del Pacifico, S.A. de C.V. (AMP), won the Pacific 12 airport package. As part of the airport privatization concession, the airport terminal was expanded and renovated in 2002, when the extension of concourse A and B was built, allowing the terminal to double its capacity. Several taxiways were also expanded to allow the operations of larger aircraft such as the Boeing 747. Nevertheless, as the airport has become one of the most important hubs and gateways in the country, and the only non-stop international gateway from Asia to Latin America, there is a plan of a new terminal, which could house the operations of the major airline at the airport: Aeroméxico (including Aeroméxico Connect). As of today, both of the concourses have been expanded and remodeled, including the progressive introduction of glass-jetways replacing the old ones. From 2011 to 2012, the airport's Terminal 1 underwent major renovations at Concourse A and B, including new customs and international arrivals facilities, construction of a new bus terminal, and other exterior renovations. In December 2015 the Cross Border Xpress (CBX) cross-border bridge and passenger terminal on the U.S. side opened. From 2006 until September 2014, Aeroméxico operated three weekly flights to Tokyo-Narita, but in September 2014 they stopped in Monterrey instead. Aeroméxico resumed services to Shanghai on March 26, 2010 after the airline halted service 11 months earlier due to the 2009 flu pandemic. The airline temporarily suspended service to Shanghai once again from September 4, 2011 to January 10, 2012. Cross Border Xpress, or CBX, is the world's third cross-border passenger terminal (after Geneva and Basel-Mulhouse). It consists of a terminal on the U.S. side of the border and a bridge to connect the Tijuana Airport with that terminal, and opened on December 9, 2015. The project consists of a second terminal, located on U.S. soil adjacent to the border, and an international bridge. This building serves as a check-in and processing facility for departing passengers only, with no gates or arrival facilities (thus functionally resembling Hong Kong International Airport Terminal 2), but with its own parking and customs offices, that links passengers to gates at Terminal 1 via a 390-foot bridge across the border. The structural scheme is intended to allow greater access to flights out of Tijuana Airport for both domestic and international air carriers. The project had an initial estimated cost of 78 million US dollars and a final completion cost of 120 million US dollars, funded by Mexican and U.S. private investors and Grupo Aeroportuario del Pacífico. Building E of Tijuana's Terminal 1 underwent restructuring, to support the new bridge own structure on Mexican soil. The initial design was the work of Ralph Nieders who first introduced the concept of a cross-border passenger terminal in Mexico City to Mexicana de Aviación in 1989, to the San Diego Association of Governments in 1990 and in 2002, to the Bush-Fox Presidential Commission, Partnership for Prosperity, in Washington D.C. The design of the joint binational Terminal 2 building is the work of late Mexican architect Ricardo Legorreta. Runway 09/27 runs east-west approximately 300 meters south of the U.S.-Mexico border. The approach to the runway is either from the east (normally) or from the west (when Santa Ana wind conditions exist). 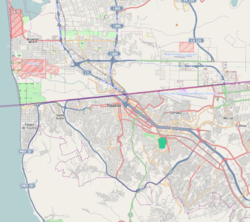 Brown Field Municipal Airport (SDM/KSDM) in San Diego, California lies just over one nautical mile (about 2 km) north of TIJ, with a similar runway length and orientation. However SDM is a general aviation field not set up for scheduled passenger service. Both SDM and TIJ are designated ports of entry for their respective countries. The airport consists of a single runway, a parallel taxiway, and a 23 gate main terminal with two concourses, a food court and a high-tech control tower, one of the tallest in Mexico. At the opposite side of the Main Terminal building there is another terminal and runway, the Old Airport Terminal, which houses military aviation, mostly performed by the Mexican Armed Forces; south of the adjacent runway (closed for commercial operations), there are 4 remote positions, mostly used by cargo airliners, linked by a shorter taxiway to the main runway. The airport is also used to a lesser extent for general aviation, housed at the General Aviation Building (GAB Terminal). Entrance to the parking lot. Check-in counters at the airport. ^1 Hainan's flight from Beijing to Tijuana continues to Mexico City, however the airline does not have traffic rights between Tijuana and Mexico City. The Old Airport Terminal (known for locals as Aeropuerto Viejo, old airport) is set for aviation of the Mexican Military and federal police forces. 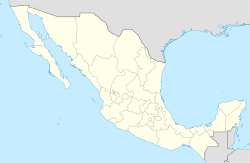 This military airbase belongs to the Northwestern Region of the Mexican Air Force. One cargo airline operates at the terminal. Incoming flights of these armed forces agencies usually arrive from the Mexican Air Force Central Region, mostly from Mexico City International Airport or nearby airbases. Note: The General Aviation Building (GAB Terminal) is used for general/non-commercial aviation or private jets. The General Aviation Building is designed to receive up to 120 persons per hour and it has all the services for the convenience of passengers during their private flights. It has a surface of 420 m2 (4,700 sq. ft.), where there are government offices, administrative offices, a pilots lounge, and passenger lounge. Two aviation schools are based at this terminal, along with one cargo airline operating there. The airport may be reached from Downtown Tijuana or Zona Rio by local bus. It costs $11.00 MXN ($0.60 USD). Aeroméxico provides a shuttle service from San Diego, California, United States to General Abelardo L. Rodríguez International Airport to allow San Diego residents make connections within Mexico, China, while Volaris provides a shuttle service between the airport and San Diego International Airport to allow passengers travelling to the United States reach their final destination. You cannot board this shuttle at San Diego International Airport. Due to a prohibition by Mexican law, Mexican cities' public taxis may drop passengers at the airport, but cannot pick up passengers from the terminal. The airport thus offers transportation for passengers from the terminal to any point of the city on the SAAT Taxis (Servicio Aeroportuario de Autotransporte Terrestre, Spanish for Terrestrial Transport Airport Service, an airport government-leased taxi company). This and other authorized taxi carriers may be reached at the arrivals hall. ^ "Traffic Report" (PDF). Grupo Aeroportuario del Pacífico. January 2019. Retrieved January 30, 2019. ^ Dibble, Sandra. "Cross-border airport bridge opens next month". ^ ""California Newest Airport Terminal Extends to Mexico, By ELLIOT SPAGAT, 'ASSOCIATED PRESS,' SAN DIEGO — Dec 7, 2015, 10:31 AM ET". ^ AENA (July 2000). Plan Maestro del Aeropuerto de Tijuana. Gruou Aeroportuario del Pacifico. p. 1.4. ^ a b Lopez, Fermin (September 30, 1970). Secretaria de Obras Publicas- Memoria de labores 1964-1970. Mexico City, Mexico: Compania Impressora y Lito Grafica Juventud, S.A. de C.V. pp. 186–215. ^ Doyle, Kate. "Operation Intercept The perils of unilateralism". The National Security Archive. Retrieved 12 June 2016. ^ Steve Casteneda-Ralph Nieders, co-authors (October 20, 1998). Crossborder Air Passenger Terminal Facility Phase 1 Report October, 1998 (PDF). South County Economic Development Council. p. 5. Retrieved August 12, 2015. ^ "Volará Aeroméxico de Monterrey a Tokio". www.milenio.com. ^ "Tijuana-Shanghai flights to resume | UTSanDiego.com". Signonsandiego.com. 2010-01-12. Retrieved 2012-09-02. ^ "Cross-border airport bridge to link Tijuana with San Diego". San Diego Union Tribune. September 5, 2013. ^ a b c "New Routes - Flights from Tijuana". VivaAerobús. March 2019. Retrieved March 9, 2019. ^ "Traffic Statistics by Airline" (in Spanish). Secretaría de Comunicaciones y Transportes. January 2019. Retrieved April 9, 2019. Wikimedia Commons has media related to Tijuana International Airport. Airport information for MMTJ at World Aero Data. Data current as of October 2006. Grupo Aeroportuario del Pacífico - Company which operates the airport.